Starting a journey as an Executive Coach is probably one of the most challenging yet stimulating tasks I have ever undertaken. From the word go, I found myself posing a number of questions and one of the most difficult one was this: Does my Coachee trust me? And, if indeed I am being trusted, how would I know this? What signs should I be looking for to be sure that trust exists? The answers came to me later on in the process when I started learning the IAC Coaching Masteries®. It was then that everything became crystal clear. The International Association of Coaching defines Establishing and maintaining a relationship of trust as ‘Ensure a safe space and supportive relationship for personal growth, discovery and transformation’. Coachees will only respond openly and be willing to share and express freely when they trust their Coach. As a Coach, I have found that Coachees are not as open during the first or second session as you would probably want them to be. This is because we have not established the level of trust between us and the coachee which would ensure that the latter may feel safe. The responsibility of building and maintaining the trust lies on the Coach. The Coach needs to demonstrate through his presence and actions that he is trustworthy. But the question is, how do I, as a Coach, increase the level of trust? Inevitably, during these initial engagements, I was continuously looking for ways to gain a deeper understanding of the concept of trust and to share it with others as I train leaders to become coaches. Interestingly, as I was researching materials relating to trust, I came across a great book called the Trusted Advisor by David H. Maister, Robert Galford and Charles W. Green. The authors postulate that to increase your trustworthiness, you need to increase your credibility, reliability and intimacy while reducing your self-orientation. As a Coach I started to reflect on how I can adapt the ‘Trust Equation’ to increase my trustworthiness. Following are some of my thoughts and suggestions to build trust in a coaching relationship. Building trust is a continuous and consistent effort throughout the coaching process. As coaches we need to pay attention to and be mindful of whatever we say and do. We need to be congruent and constantly align our intentions to the coaching process to achieve the results that the coachee desires. We must also be mindful that we are there to unlock the potential of our coachees. Thus, we need to trust them and believe that they have the inner potential to achieve their individual goals. It’s the rare parent or teacher who haven’t heard their wards, whilst in the midst of practicing an activity, complain of being ‘bored’? If they were doing activities that seem like ‘work’ (studying) we might appreciate this feeling but when the activity is one that is also fun-filled, like learning to play sports or a musical instrument it appears puzzling. Our usual reaction in such situations, is to suggest that ‘practice makes perfect,’ a perfectly acceptable response if only it were wholly accurate. Does continuous, mind-numbing repetition of a particular movement actually lead to perfection or is there more to the act of practice? When practice is applied as a noun, it stretches beyond a routine activity that leads us to a specific goal or destination. Instead, it extends to being an integral part of our lives. Adopting the concept of making practice integral to our being, we would first need to find a way that helps us to escape the drudgery of repetition, an early step which leads to a state of boredom. Mihaly Csikszentmihalyi, the renowned polymath and positive psychologist, while discovering the concept of being in ‘flow’ links boredom to seeking an active balance between the challenge that is posed and the level of skill applied in dealing with it. Persons engaged in an activity tends to relax and subsequently slip towards boredom if their skill levels comfortably exceed that needed to manage the challenge. At this stage, to stay on the path to mastery requires us to first enlarge the scope of the task and then working on developing the skill needed to meet it. Consequently, as the task continues to increase in complexity and get more demanding we start getting more and more absorbed and actually find enjoyment in performing it. The coaching profession offers us the unique opportunity where practice is almost always in a unique context with little scope for boredom. For instance, were we to ask a variety of clients the same set of questions, we will be assured of a unique set of answers. The IAC’s mission is ‘To Expand the Path to Coaching Mastery.” As practice pulls us towards Mastery in coaching, then it important that for Mastery we remain on the path. To share more on the topic, please connect with me at president@certifiedcoach.org . 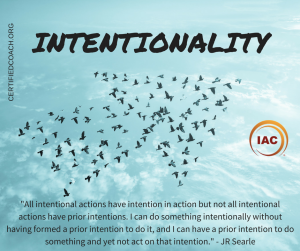 As I write this piece today I find myself intrigued by the relationship between intentionality and action. Without action, intentionality is orphaned to the world of make-believe. Now that’s a powerful thought, sitting as I am today with what I delude myself into believing are good intentions to make progress towards enrolling participants in an upcoming event. Yet I find myself paralyzed and taking little action. What is stopping me turning my intentions into action? I start from the awareness that I know what I’m ‘supposed’ to do: call this person, email that person, send a photo to another person, gradually working through my list of invitees. Yet I’m still not doing it. It’s that word ‘supposed’ that’s stopping me. If I’m ‘supposed’ to do it, have I, in fact set a true intention to make it happen. This becomes a great pivot for me to self-reflect and inquire into my intentions for this upcoming event. I realize that I have not set specific enough intention. I thought I had: envisioning people sitting in the room with me in two months time and feeling committed to them being there. Wrong (or non-specific) intention though, leads to wrong (or no) action. My high level intention to run my event, does not translate into specific step by step action that moves me towards making it happen. I need more tangible intentions that will eventually lead to the fulfillment of the bigger dream. So I shift my intention and break it down into clearer steps. My intention — even in the course of my conversation with my coach — becomes ‘call these two people and call them NOW”. My coach actually hangs up the phone while I go and make the calls and invites me to call him back when I’ve done it. Immediate intention, immediate action. Next I set a smaller and clearer intention for tomorrow. I WILL call Ian, James, Anita and Sue. Even as I write this commitment as a clearer intention I want to add more names to the list — feeling the momentum building once that first intention is fulfilled. Cary, Bruce and Kelly get added to my call list. And that’s enough. If I let that list get too big again, too quickly it will move farther away from the action required to fulfill the intention. It just becomes some big, unwieldy task list again. Better to keep it small. One step at a time. And that’s where I get my big ‘aha’ about intention. My real intention, the one that’s going to serve me best, is to have the intention about my process and not my outcome. My intention becomes “make the calls” rather than fill the event (which of course will be the result of fulfilling my intention to make the calls). Intention finds its home when I directly relate it to an action I can take in the immediate future. That creates an intention I can, and will, fulfill. One intentional action step at a time. Aileen Gibb, Master Masteries Coach with the IAC, is currently taking her coaching to the next level, through her work in the field of leadership conversation, with individuals, entrepreneurs and mission driven, next generation, businesses. Her current client base spans leadership in the computer games business, with toxin-free health and beauty products, across loyalty sales, advertising and property development and in pursuit of the shifting scopes of the energy industry, where she spent a large part of her own career. Her favourite quote at this time is: “the kind of conversation I’m interested in is the one which you start with a willingness to emerge a slightly different person” (Theodore Zeldin) — a quote which sums up the invitation she extends to all her coaching clients. Check out www.aileengibbinspires.com for current events and availability. Aileen currently splits her time between her adopted home in the Alberta Rocky Mountains of Canada and her native homeland in the northeast of Scotland. “Compassion is the radicalism of our time,” said the Dalai Lama and inspired by his words in October of last year I wrote that coaching might be the perfect vehicle to offer “Compassionate Leadership” to our turbulent world. (positive psychology), presentations made at global conferences and work by leading Universities (Stanford, Berkeley). They add to the wealth of wisdom passed down through the ages by spiritual leaders and philosophers from the East and the West, providing us with an eclectic mix to devour, develop and act upon. Going beyond how can coaches, using the power to influence ourselves, our clients and our social environment encourage and develop the practice of compassion? Practicing compassion has deep connections with training in mindfulness and meditation. It is proven method to foster cooperative learning in schools by encouraging cooperation over competition. In coaching, we might expand our coaching skills by introducing the elements of compassion. To illustrate, in coaching conversations we often need to navigate through a complex web of perceptions that our client has shared, which when it clashes with our own might defeat the traditional listening techniques. On such occasions, the famous Buddhist monk, Thich Naht Hanh, mentions using compassionate deep listening to work through another person’s perceptions and help them find resolution and healing. At the IAC we remain committed to our mission to “Expand the Path to Coaching Mastery” and have constituted a Research and Collaboration Portfolio, headed our Governing Board colleagues, Dr. Luis Gaviria and Mr. Philip Beddows, to work towards this objective. In the following months, we plan to conduct a series of Coaching Master Classes, which will cover many exciting topics, such as the application of the Neurosciences in coaching and using Compassion in Coaching. We encourage the IAC community to actively join and participate in these Master Classes. As always, I will be delighted to know your thoughts and ideas. Please connect with me at president@certifiedcoach.org.